Spring is in the air which means it is the perfect time to start sharing gorgeous spring-inspired wedding cakes. Today’s cake is lovely and spring-y and adorned with flower petals. Sugar flower petals to be exact. And we all know sugar flowers are better than real flowers because you can eat them. This three-tier white cake is anything but boring with these gumpaste petals giving just the slightest hint of color as they are each painted with light pink and green. Your guests will ooh and aah over this cake and it’s the perfect floral cake for your spring or summer wedding. 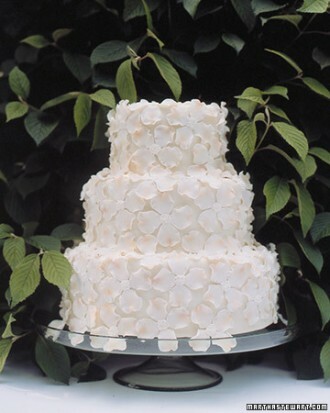 No need for a cake topper here – the gumpaste petals are all the accents you need. You can find this lovely floral cake here.